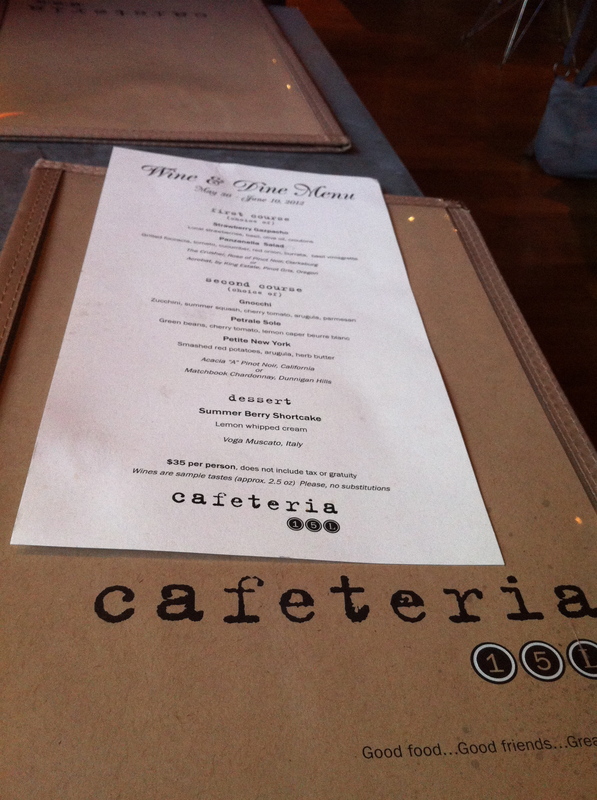 For our second stop on Wine and Dine Week, we visited Cafeteria on L. After having read the menu, it was clear that I needed to check it out. I mean, seriously? The entire menu sounded delicious, plus it included wine. And, at $36.99 a person, it’s quite a steal. Combine this with the fact that Monday is half -off-bottle-of-wine night and I certainly can’t say “no” to that kind of a deal! One of my personal faves is Kali Hart chardonnay. 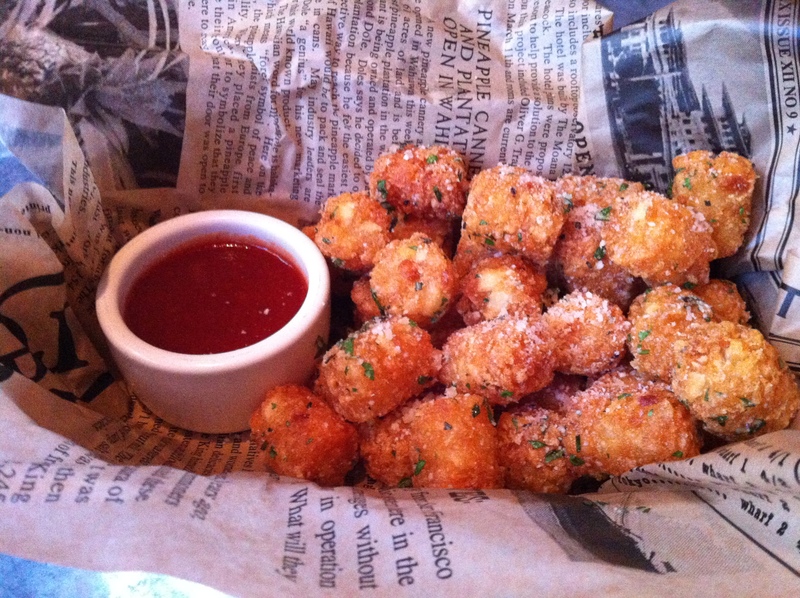 I admit it, I’m a sucker for amazing tots… and this place has them! So long disgusting, overly oily and mushy high school tater tots and say hello to crunchy, perfectly seasoned tots with truffle oil, herbs, a sprinkling of parmesan cheese and a ramekin of house made ketchup, of which I’m not a fan, but who cares with tots like this! They certainly stand on their own. 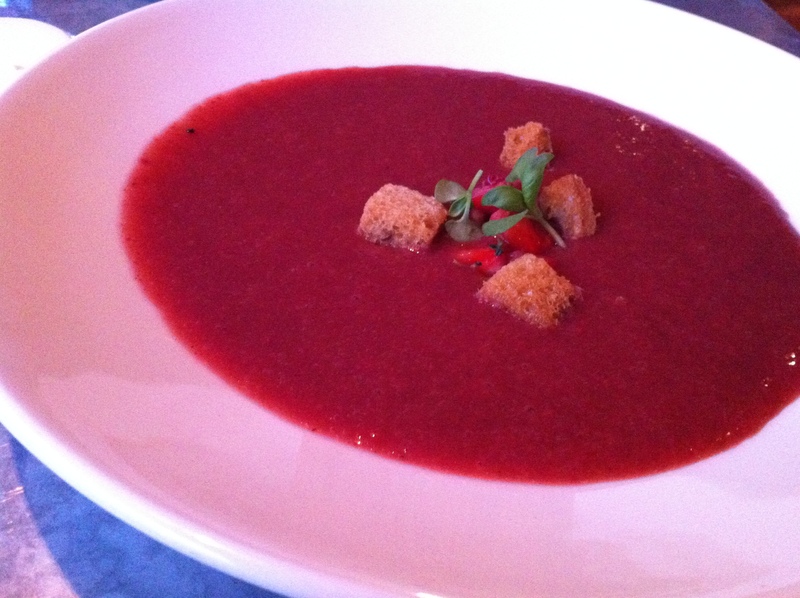 For the first course, Strawberry Gazpacho with local strawberries, basil, olive oil, croutons. I’m not a big fan of gazpacho, but this was okay. I was worried it would be extremely sweet and be more like melted sorbet, but it was nicely balanced. The sweetness and flavor of the strawberries were the stars of the show, but it was offset with just enough savory to make me not dislike this gazpacho. 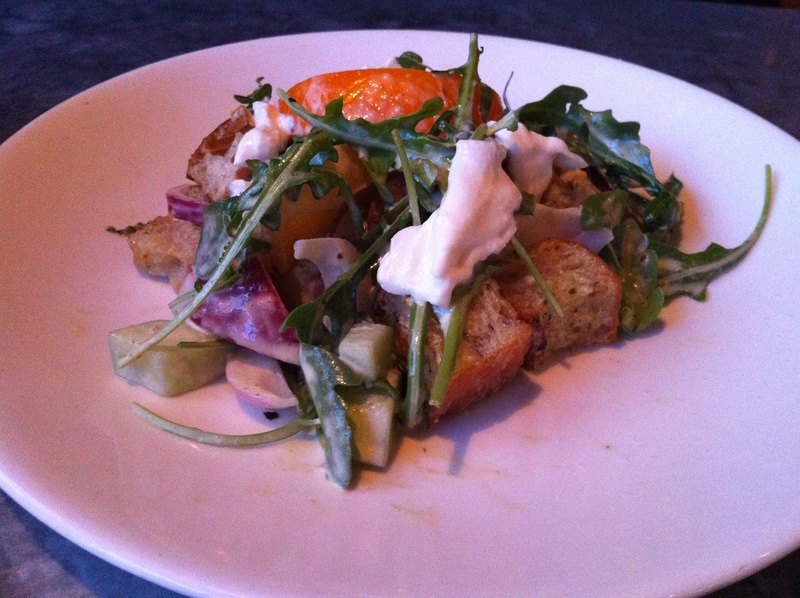 Also was a Panzanella Salad that was really quite delicious. It featured grilled foccacia, with tomato, cucumber, red onion, and burrata, and was dressed with a delicious basil vinaigrette. Naturally, I liked this better than the gazpacho, but it stands out excellently on its own. Paired with these was a pinot gris from Acrobat by King Estate in Oregon. The entrees were really good! 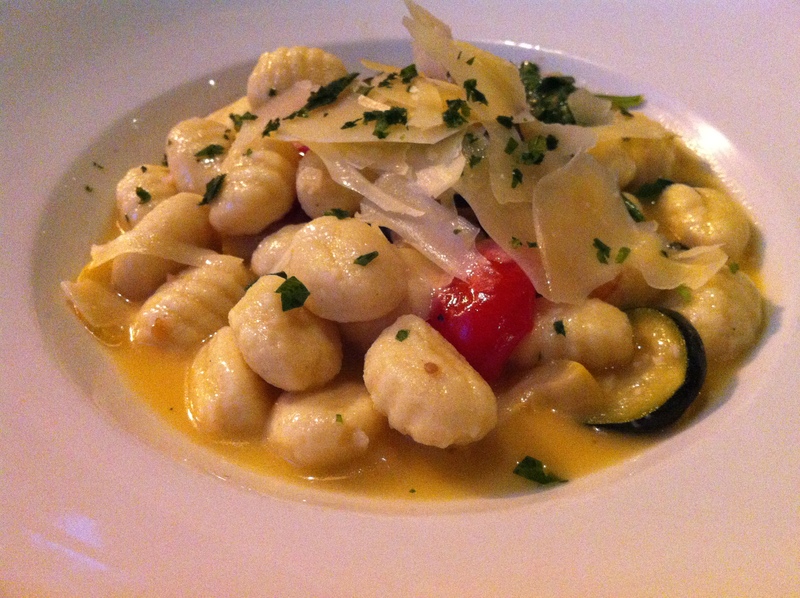 First off… Gnocchi! It was a lovely summer dish with zucchini, summer squash, cherry tomato, arugula, and parmesan. It was a hearty portion that also served me well the next day for lunch! 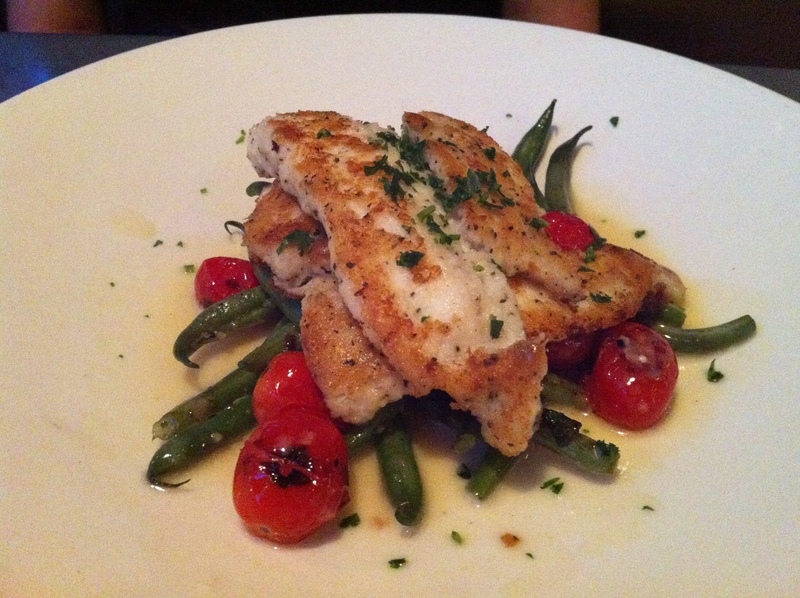 The fish offering was Petrale Sole served with green beans and cherry tomato, with a lemon caper burre blanc. Dessert was amazing! 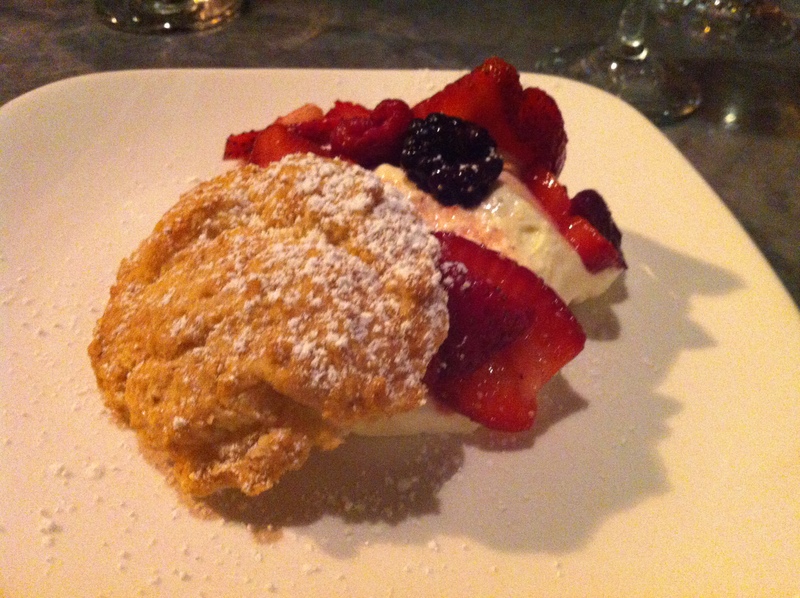 Summer Berry Short Cake with lemon whipped cream, and served with a sparkling wine from Kenwood. I really loved this! 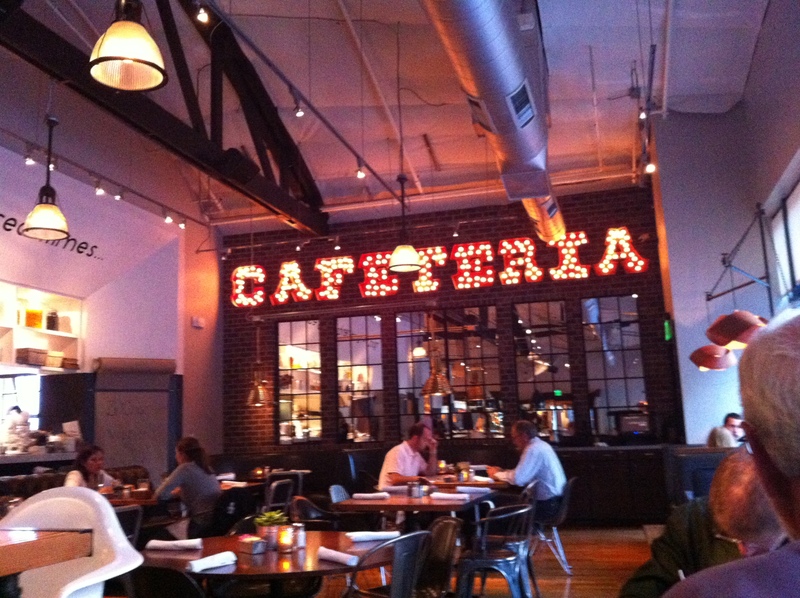 Cafeteria 15L also has a really good happy hour, so check that out! Okay, so we all remember what I thought of Mulvaney’s the first time. If not, go here to read how utterly underwhelmed I was. 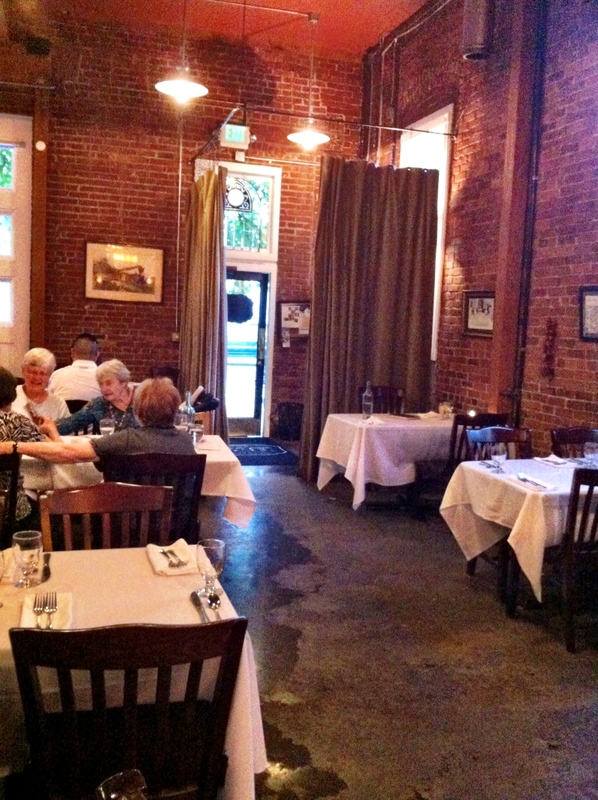 But when the menus were released for Sacramento’s Wine and Dine Week, I had to check out Mulvaney’s. First off, all the dishes were suited to my pescetarianism, and second, the featured wine pairings were from Easton/Terre Rouge, a favorite of mine that is located up in Amador. “What IS Sacramento Wine and Dine Week,” you ask… Well, it’s the best way to try out restaurants you may otherwise have avoided due to cost, generally. The participating restaurants create an affordable prix fixe menu, consisting of at least three courses, and include wine pairings with each course. Places like Ella, Tuli Bistro, and the Firehouse are all joining in the fun. I absolutely LOVE Wine and Dine and Dine Downtown weeks! There are many excellent spots this year, and I plan on hitting up two more this week! In the end, it all comes down to what you like to eat and how much you want to spend. 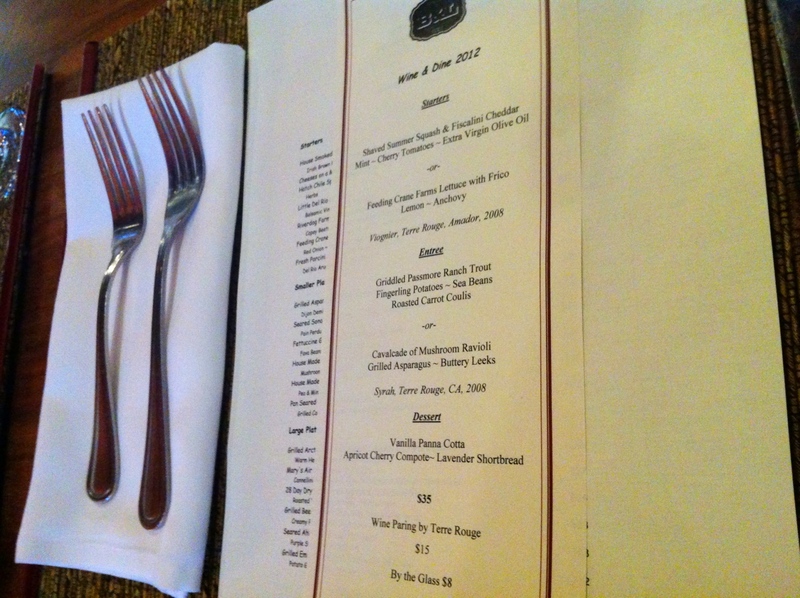 Generally, the menus are around $35, with wine pairing costing an additional $15. Sometimes it’s included, sometimes not. Some restaurants are offering more than three courses, so I usually look at my faves first, then peek at other places to see what speaks to me. Hopefully it’s not swearing at me in another language. But back to Mulvaney’s… This time around, it was an entirely new experience. 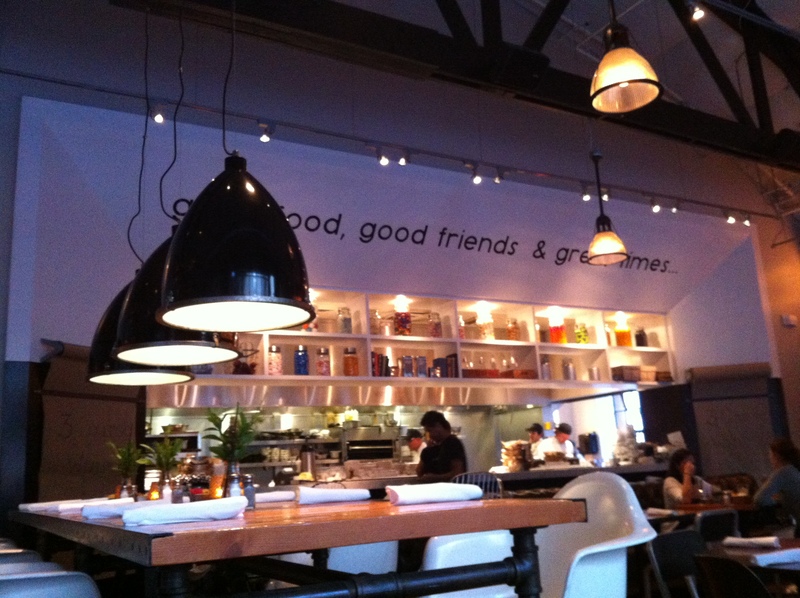 If you frequently dine out, making reservations through Open Table works great. You make your reservation online, making it easy to modify it, and you also earn money back in the form of a check you can redeem at any participating restaurant. They also have a mobile app for both iPhone and Droid. “Why am I talking about Open Table,” you ask… boy, you’re full of questions today. The reason is that after seeing no slots were available within a two hour window, we made reservations at Cafeteria on L, but decided to run over to Mulvaney’s to see if we could get seated. That worked out well! Instead of sitting in the regular dining area, we got to sit at the bar (not the boozy one), also known as the chef’s table. It’s butted up next to the kitchen and is where the “cold” stuff happens: salads, desserts, the cheese plate… those sorts of things. We watched the chef adroitly mandoline slice squash, wondering if she’d ever sliced off a piece of her fingers… hoping that if she did, it wasn’t into our salad. The silverware is also kept within the bar-height table, so there are alsways servers hustling to and fro, so service here was super quick and excellent. Our bread got refilled at an alarming rate, our water glasses were always full, and it was a great spot to watch the near-misses of servers running out of the kitchen door and others running towards the fridge at the back of the wall. 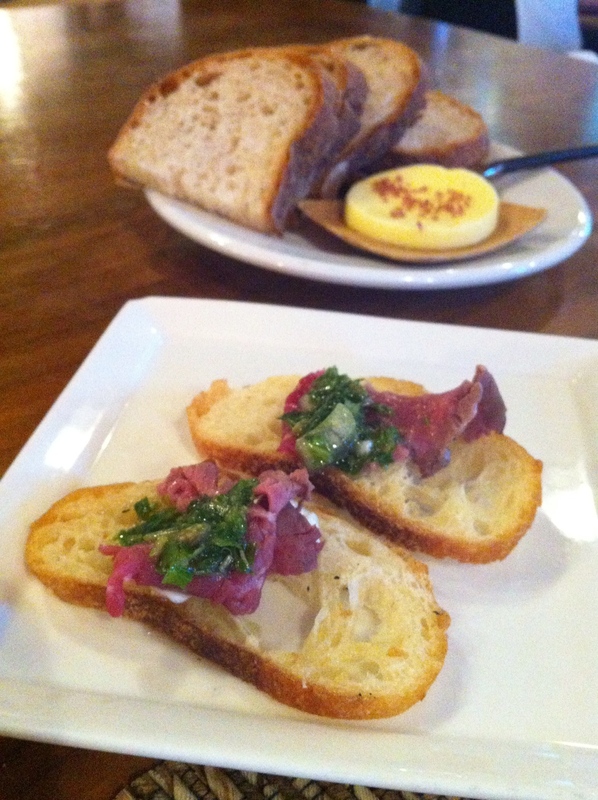 As with our first visit, we started off with a beef amuse bouche… some kind of steak tartare. We were starving and decided to start with a cheese plate and bubbly. There were four cheeses: two goat’s milk, one brie, and a delicious blue. We followed that up by simply saying to the server,”One of everything,” on the prix fixe menu. Our server also happened to be the same one we’d had before, and even better is that she remembered us. First off were the salads. 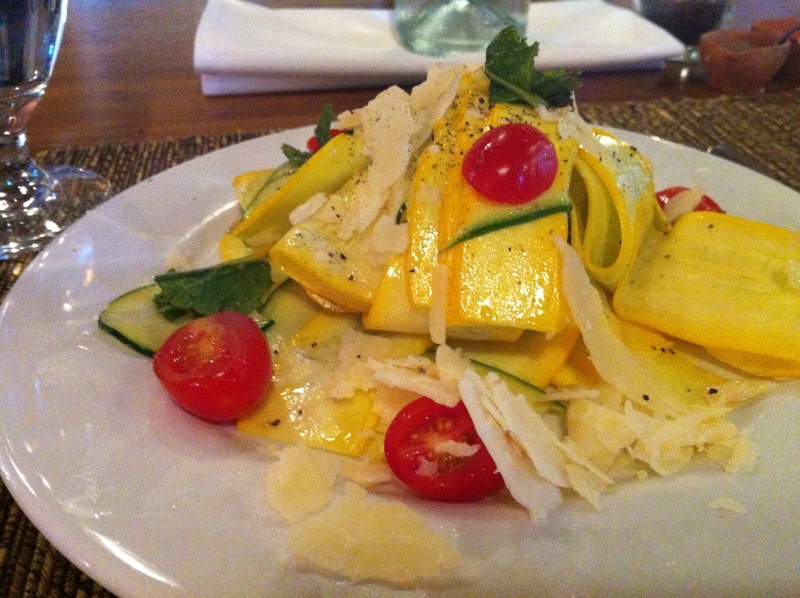 Here is Shaved Summer Squash with Fiscalini cheddar. Mint, cherry tomatoes, and EVOO rounded out the flavors. This was refreshment on a plate. I generally am not a huge fan of squash, but the zucchini and yellow squash were really delicious with the tangy cherry tomatoes. The mint added the perfect amount of sweetness and flavor complement, while the EVOO was all it needed to dress it. 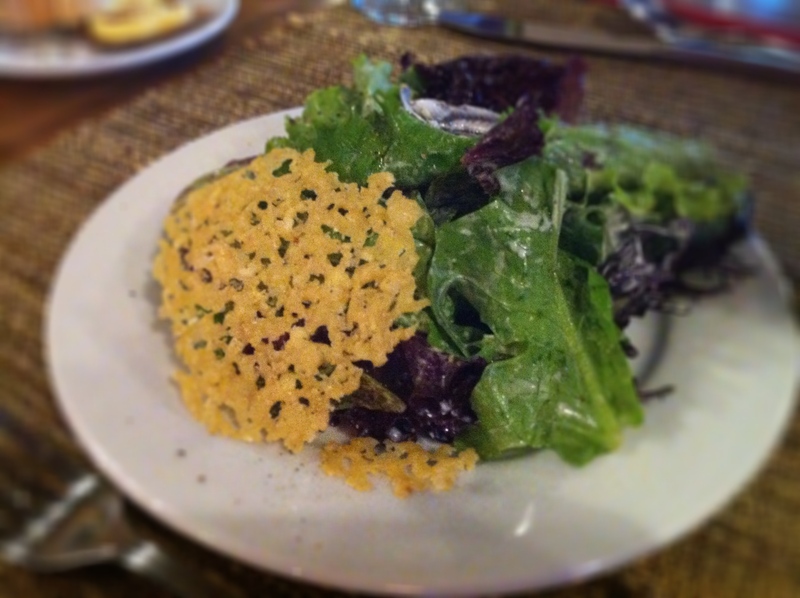 The other salad was Feeding Crane Farms Lettuce with Frico, which is just a fancy pants way of saying “fried cheese cracker,” and topped with anchovies and a lemon dressing. So this was basically a Caesar salad… but one of the best you’ve ever had. The anchovies were delicate and tasty, the dressing perfectly lemony, and even though I’d consumed a boat load of fried cheese the night before, this frico was freaking good. For the main courses, one fish and one vegetarian… perfect! 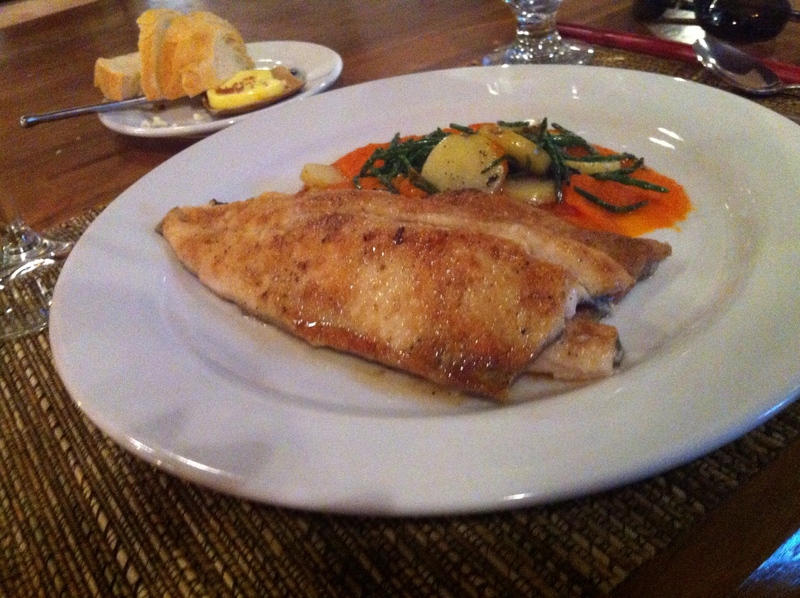 Passmore Ranch Trout with Roasted Carrot Coulis, served with fingerling potatoes and snap peas. I could have eaten this entire plate. It was a generous serving of yet more fabulous fish from Passmore Ranch. The snap peas were really exquisite and all the ingredients meshed well together. I’m a big fan of trout (not Trouty Mouth, folks, though it was a pretty funny song) and enjoyed the preparation very much. 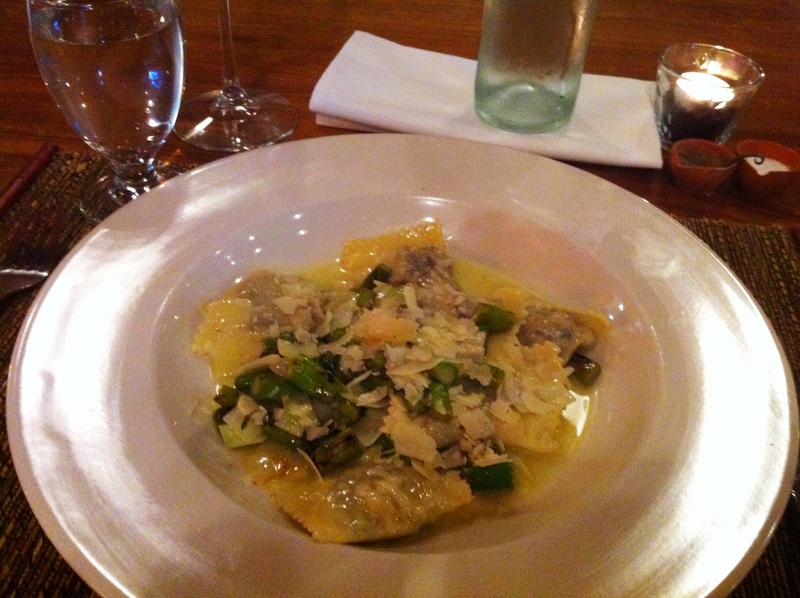 Hen of the Woods Mushroom Ravioli with grilled asparagus and leeks. Another hearty portion! I’m a huge mushroom fan and I’ll take them almost any way I can get them! The ravioli were stuffed with a mixture of mushrooms, cheese, and some other ingredient I couldn’t quite put my finger on. The overall effect was texturally a little off for me. The flavors were fabulous, but it almost seemed like the balance and consistency weren’t quite right: too much mushroom in one ravioli, not enough in the other, etc. There was lots of parmesan on top, which I loved, and the leeks added a nice sweetness to the overall dish. While I liked this very much, I think I probably ate more of the trout. I mean, ravioli reheats so much better for tomorrow’s lunch, right?! 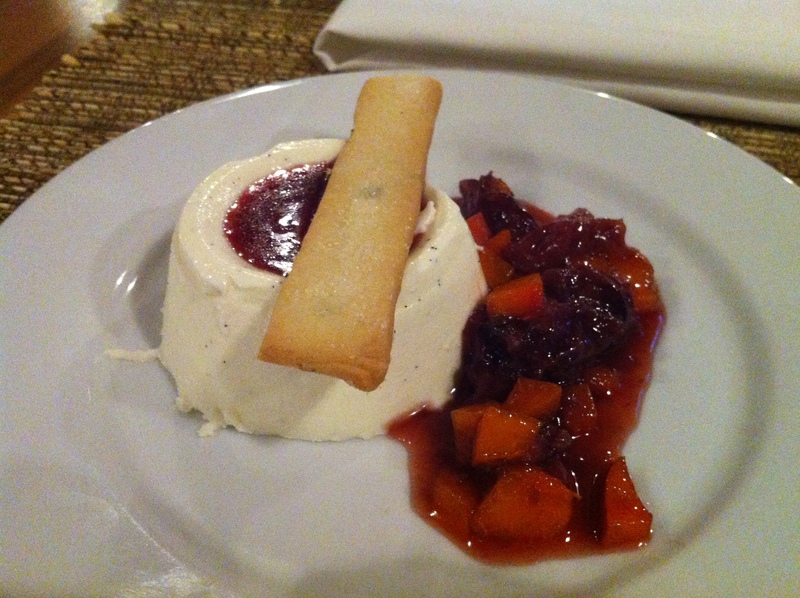 For dessert: Vanilla Panna Cotta with apricot cherry compote and lavender shortbread cookie. Okay, I already was full, but I finished this. The cookie was my favorite part – crunchy, sweet, and I absolutely loved the lavender. The compote was also fabulous. And one of my favorite parts of the meal? The way they present you with the bill! 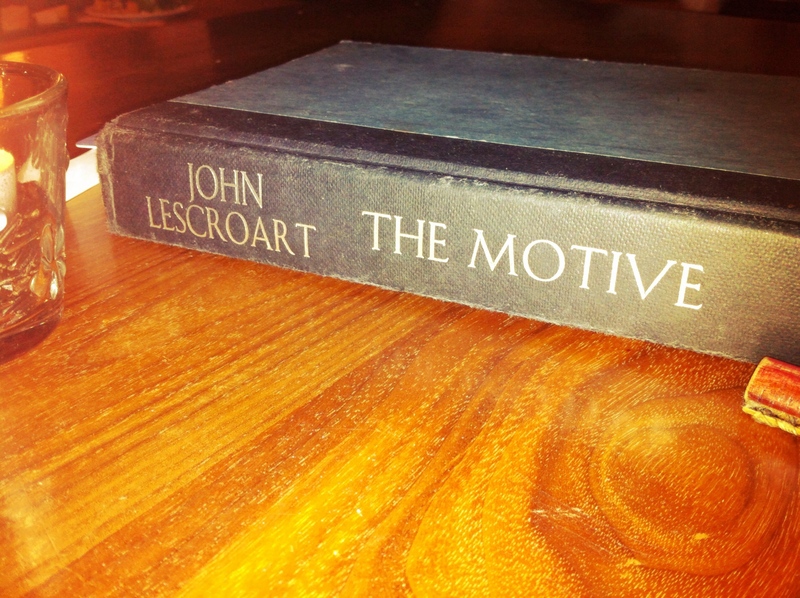 My “motive” this time around? Great food! And I got it this time at Mulvaney’s.